China Kitchen currently does not offer online ordering. If you see a website that you can order online from us, please notify us immediately. Do not complete your order as it may be a scam. Whether you want the standard fare of Egg Rolls, Crab Rangoon and Fried Rice, or want to try something more adventurous like the our Teriyake Satay or Seafood Delight - we have just the dish to satisfy your Chinese food cravings! Feel free to browse our menu and give us a call when you are ready to order. Food orders may be ready for pickup in as quick as 10 minutes. We also deliver and cater to various areas in Arlington Heights, Wheeling, Mount Prospect and Buffalo Grove (please call to inquire if we delivery to your area). 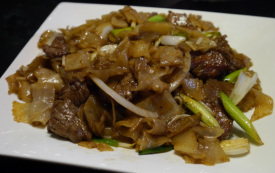 This Cantonese staple features stir-fried beef tossed with green onion, bean sprouts, white onions and wide rice noodles in soy sauce. This noodle dish is available with a variety of sauces under the Chow Fun section of ﻿our menu﻿. free order of egg rolls! Click here to go to our Yelp page.